These chocolate sugar cookies are straight up addictive!! How was everyone’s holiday weekend?? Mine was lovely – I spent a long weekend at the beach with my extended family. We do beach family reunions about every 5-7 years, so it was a big deal and big fun. We even managed to get all but one uncle and one grandkid (Logan) there for at least part of it! I spent all day on the beach swimming with cousins, reading like mad, and relaxing with family. It was perfect. Being at the ocean restores my soul; I can feel something start to decompress within me at the sight of the waves on the sand. 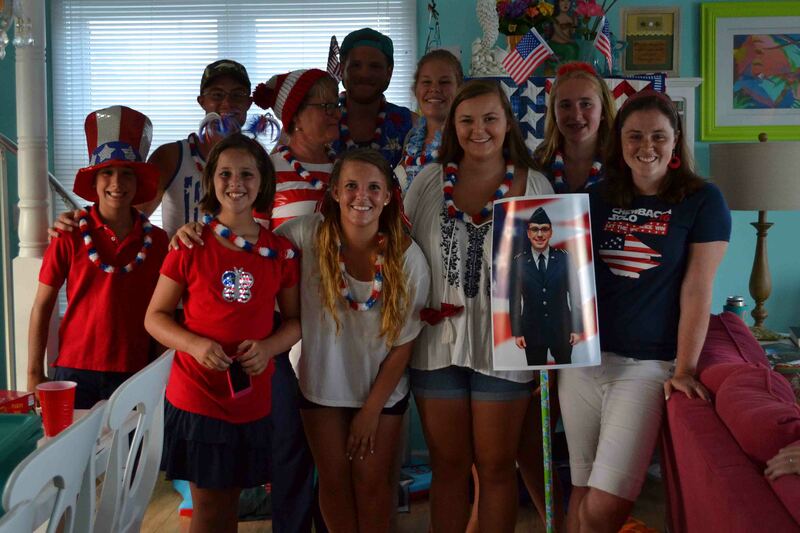 We even had a Red, White and Blue party to celebrate Independence Day, hosted by my 12-year-old cousin Claire. Complete with decorations and a costume contest, this party was for real. And this reminded me that my family takes costumes (and contests) very seriously. I was pretty proud of my Chewbacca Solo 2016 shirt, but realized that I was pretty underdressed compared to most everyone else. However, I had a ringer by way of bringing a massive photo of Logan in uniform as part of my costume. My brother even photoshopped an American flag in the background. (The same genius brother who started his own web development and video production company right out of college. He’s the brains of this operation, the rest of us are just along for the ride.) Long story short, Claire gave out prizes for the costume contest, and I won first place! Let’s be honest, it is 100% of the Logan photo and my cousin taking patriotism very seriously, bless her. Most of the cousins, plus Waldo mixed in for good measure. All of that to say that once again, I find myself unprepared for a Triangle Tuesday entry. In my defense, I’ve taken 6 trips in the past 5 weeks, so life has been only marginally lived in my actual city. But never fear, I’ve already got next week’s adventure lined up, so I’m sure to have an entry then! In the meantime though, I wanted to leave you with one of the best cookie recipes I’ve ever made. This one is a recent discovery for me – thank you Pinterest for your never-ending supply of food experiments. One of my main beefs with homemade chocolate baked goods is when they’re not chocolatey enough. I need enough cocoa in the batter/dough/mix to make what I’m eating not just have a hint of chocolate, but to seriously be the primary flavor. If I want sugar cookies, I’d make them without chocolate. 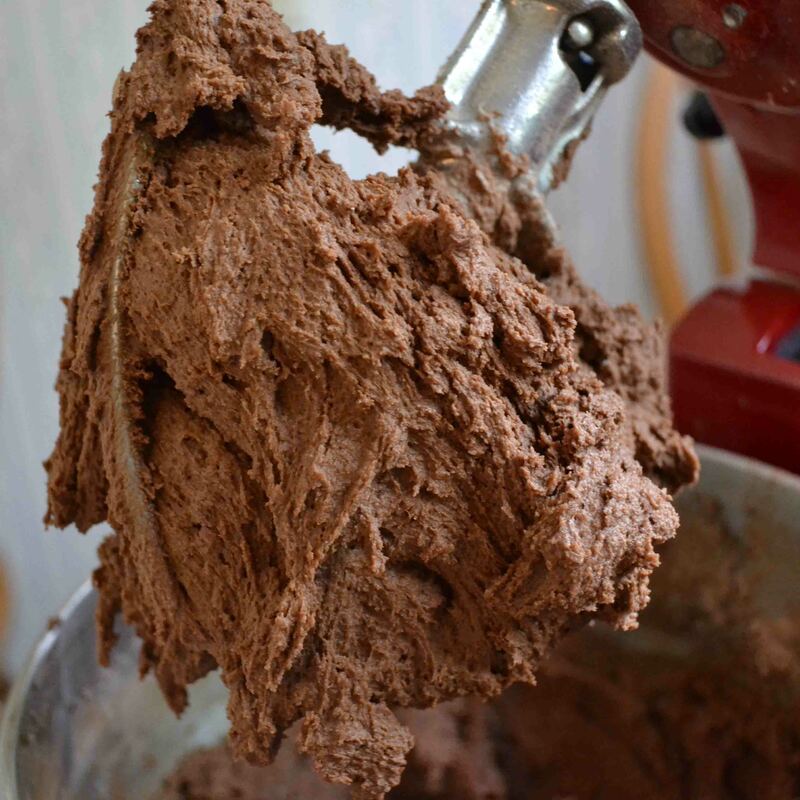 I recently came across this recipe and knew I had to give it a shot: after all, I am a complete sucker for chocolate and for baked goods. And these achieved the perfect amount of gooey that I crave in a cookie. Put all this together and we have a killer cookie recipe. Recipe adapted from this blog. Start, as always, with what makes all baked goods delicious: butter. Then beat in sugar. Mix until fluffy and butter gets lighter. See how the texture changes? Then beat in eggs and vanilla. Starting to look like dough. Add in your dry ingredients. Dough will end up looking thick and rich. Don’t you just want to eat that straight off the beater?!? I may have. To me, this looked to difficult to form into balls before baking. Tossing it in the fridge for a couple hours (or even overnight) lets the dough firm up to hold its shape while baking. Preheat the oven to 350° and spray a couple baking sheets with nonstick spray. In a shallow bowl, put some sugar: enough to generously cover the bottom of the bowl. Whisk together flour, cocoa, salt and baking soda. In a large bowl, beat the butter for 3ish minutes, then add sugar and beat for a couple more minutes. The color should get lighter and the whole thing gets fluffy. Beat in vanilla and eggs until well combined. Add the flour mixture, half at a time. Combine on low but don’toverbeat! At this point, if the dough is really soft, you may want to let it chill in the fridge for an hour. This lets them roll better in the next step, and as a bonus I think it helps the cocoa meld into the butter! Once the dough is a little former, roll into balls about an inch in diameter. Put each ball in the sugar mixture and coat thoroughly before putting on your baking sheet. The recipe should make around 25-35, depending on the size of your balls of dough. Cook for 9-10 minutes. Cookies should’ve naturally flattened and stared to crack on top. I pulled mine out a tiny bit early, then let them cool while still on the hot baking sheet to finish them off.